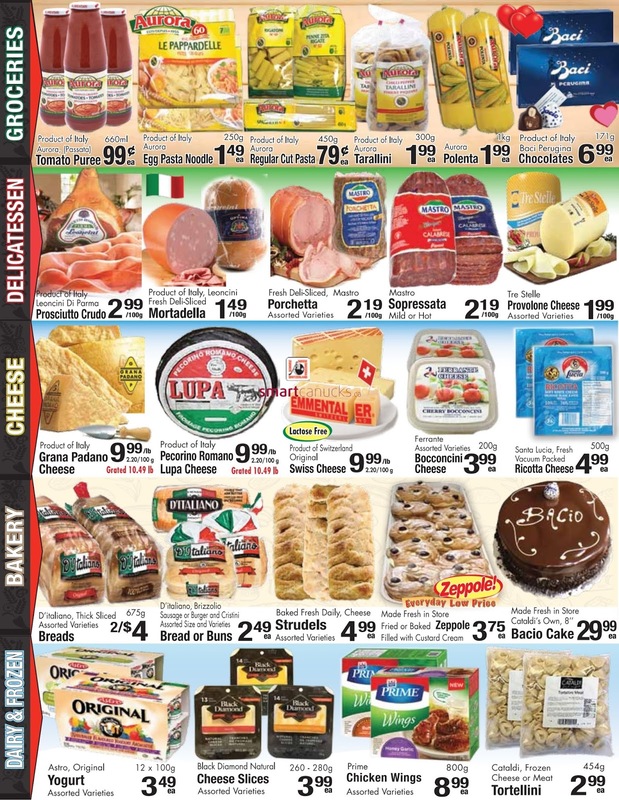 Cataldi Fresh Market Canada Flyer February 7 - 13, 2018 - D'italiano, Thick Sliced 675 g Assorted Varieties Breads 2/$4. Astro, Original Yogurt Assorted Varieties 12 x 100 g 3.49 ea. D'ita lia no, Brizzolio Sausage or Burger and Cristini B Assorted Size and Varieties 249 5 Bread or Buns ea 2.49 ea. 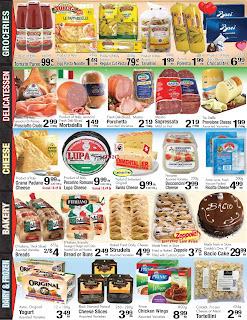 Cataldi Fresh Market flyer Product of Italy Grana Padano Cheese 9.99 /lb 2.20/100 g Grated 10.49. Product of Italy Pecorino Romano Lupa Cheese 9.99 /lb 2.20/100 g Grated 10.49. Product of Switzerland Original Swiss Cheese 9.99 /lb 2.20/100 g. Product of Italy 660ml Aurora, (Passata) Tomato Puree 99 c ea. Product of Italy Aurora Egg Pasta Noodle 250 g 1.49 ea. Product of Italy Aurora Regular Cut Pasta 450g 79 c ea. Product of Italy Aurora Tarallini 300g 1.99 ea. Aurora Polenta 1 kg 1.99 ea. Product of Italy Baci Perugina chocolates 171 g 6.99 ea. Product of USA Andy Boy 3pk Romaine Hearts 2/$5 . Product of USA Organic Cauliflower 2.99 ea. Product of USA Strawberries 1 lb 2.99 ea. Product of Ontario Golden Delicous Apples 99 c lb 2.18 kg. Fresh Atlantic Salmon Fillets 8 99/lb 19.82 kg. From The Tropics Organic Bananas 99 c lb 2.18 kg. From The Tropics Large Pineapple 2/$5.